I can't believe how fast 2013 is just flying by. As some of you may remember this time last year I got to participate in the Hidden Valley Ranch Recipe Challenge. Sadly I didn't win, but I had a blast trying out the new ranch flavors and mixing them in with my food. We love Hidden Valley Ranch in our house and with only one bottle left I can tell you we've been using their ranch on any and everything! Well, I'm at it again and this time with a delicious recipe I found via Pinterest from the lovely lady over at With A Grateful Prayer and a Thankful Heart. 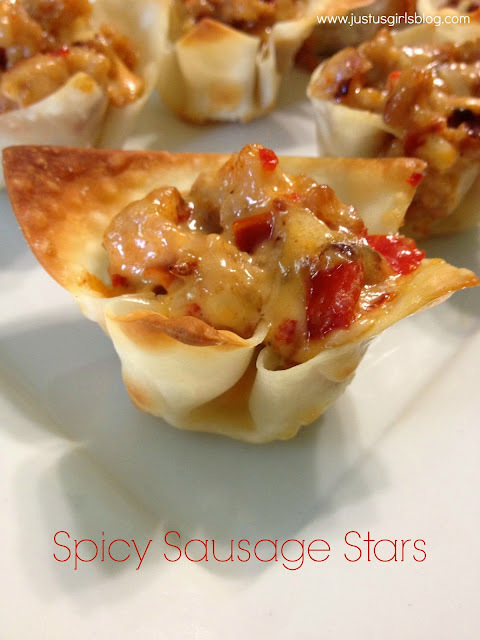 I decided on these Sausage Stars because not only was this an easy recipe, but it makes up to four to five dozen and is pretty perfect for a small appetizer for almost any party or get together. I tweaked the recipe just a little so that I could use the Spicy Ranch dressing instead, we enjoy a little heat in our food in this family. I do hope you make it and serve it at your next party! What would you add Hidden Valley Ranch to? You can find tons of different recipes over in their recipe box on their website to try, be sure to check it out! Cook sausage and drain oils/grease. In a bowl combine with cheeses, salad dressing, and peppers. Grease a mini muffin pan with cooking spray and put one wrapper in each cup pressing the won ton's down to make a cup. Lightly spray with vegetable spray and bake for 5 minutes until golden. Remove from tins; place on baking sheet. Fill with sausage mixture. Bake 5 another minutes. Let cool and eat and enjoy! Disclosure: All opinions are my own. I participated in the Hidden Valley Ranch Recipe Challenge which included three bottles of ranch and a $50 gift card to get the ingredients to the recipe I used. No other compensation was received.